Some also split of the balance sheet between restricted and unrestricted assets, liabilities, and funds. 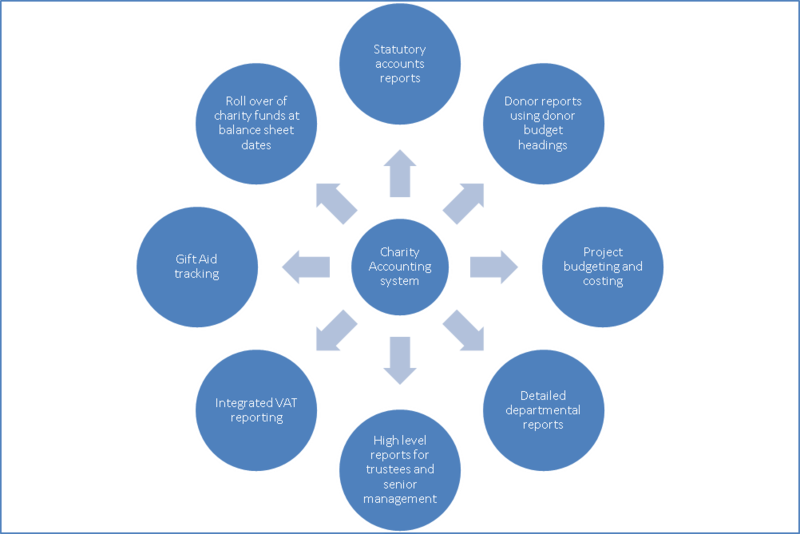 Any good finance system for a charity should provide multi-dimensional views of data so that a single entry can be categorised in multiple ways to fit the different reporting requirements. Unfortunately, the majority of finance systems on the market are built for commercial organisations. There are very few which are customisable enough to cater fully for charity needs. Parent-child structure in the nominal codes This can be helpful in creating report views that are based on the chart of accounts – e.g. Timesheet recording If you need to maintain timesheets, could this be done within the finance system so that time reports can be linked to to other reports (e.g. donor reports)? Each block / categorisation required in reporting would need its own system object – otherwise it becomes impossible to distinguish the data in reports. Automatic funds rollover at yearend Do you need this to happen automatically or can you live with a manual journal entry? Software updates for new features as they become available Free or payable? Is it an annual license? Support plan options Do you have to pay for after sales support or is it included? User interfaces How easy is the software to navigate? Can you see the full text of the list selections? Is it a system where you type any part of a field and select? Multiple windows: can you view multiple windows at the same time? Easy error correction Can you easily correct errors or is the system too rigid? For various reasons, most small charities will need to have a fairly flexible system for error correction. Integrated VAT reporting Particularly if your charity has exempt activities. As a charity, chances are you have outside the scope income (grants and donations), exempt supplies would bring into the picture partial exemption calculations… Not all systems will cope well. Multiple budgets Can you have multiple budgets for the same period? Can you budget for multiple financial periods? Project budgets Can you have individual project / activity / fund budgets? Donor budgets Can you have budgets by individual donor? Drill down to the transaction level Is this possible on all reports or just some or none? Donor dimension reporting Where a donor report describes expenses differently from the standard chart of accounts, is there an option to slice information in this additional dimension at a transaction level and in reports? Expenditure to be analysed by funding source or donor Most systems will be able to give a report of income by donor; many will not be able to give you report of expenditure by donor because they don’t have the ability to mark expenditure as being paid for by this or that donor. This is not an exhaustive list, but it may be a good starting point for assessing a charity’s requirements when considering a new finance system. This entry was posted in Governance and risk and tagged accounting system for charity, charity accounting system, charity VAT reporting, donor reporting, project budgeting, project costing. Bookmark the permalink. How others perceived working with us.